Sixteen students in the Art Integration class at Grace College, Winona Lake, Ind. 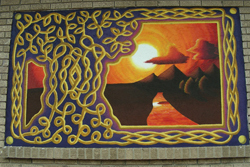 (taught by Cindy Bryan), worked in the early fall of 2012 to produce six images on the south wall of the Brethren Missionary Herald/Tree of Life building, located at 1104 Kings Highway, Winona Lake. They worked in three teams, with individuals responsible for developing the artwork, painting, documenting, and marketing the project. 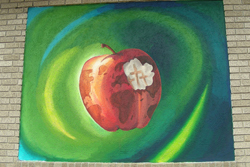 With the sale of the BMH building to Winona Lake Grace Brethren Church in 2017, and its subsequent remodeling, these murals are no longer located in the plaza. We continue to maintain this page in recognition of the student’s work. The theme is life, explored in its inextricable link to divine grace. Each aspect of the painting functions symbolically in relation to the theme and welcomes the inquisitive viewer to a variety of interpretations. The broadest areas of the painting, the fields in blue, red, and gold surrounding the central forms, evoke a series of expanses both literal and figurative. Blue is the wide sweep of atmosphere where life flourishes on earth, a free ocean of air in which all things move and breath. The viewer catches a glimpse of the stars either from space passing beneath the arc of the earth or gazing up from the ground at the evening sky. The red is the warmth and richness of the earth flowing generously with life-giving substance, an abundance of vitality and nourishment. Gold, the richest, largest, and most dominant of the fields is God’s grace. Borrowing this symbol from ancient Christian art, gold in its purity and splendor displays the holiness of God and here manifests his grace in giving us life abundantly. The central subjects of the composition evoke life in essence, plant, animal, and human. At the center is the symbol of life in its infancy. Wreathed in a golden halo, another symbol borrowed from ancient iconography, life is reverently depicted as a sacred and precious gift from God. Leaves sprout from the center as well as gnarled branches and ripened pomegranates, all symbols of life in its progression from infancy. The leaves bask in the glow of the divine light, depending on that grace for their sustenance, the twisted boughs suggest the pain and suffering which all life is subject to in the fallen world, and the pomegranates are the good fruit brought forth through patient endurance. All is arranged in a circular fashion, suggesting the cyclical nature of life, its rhythms, and repetitions. All is revealed by the divine light issuing from the golden field, and all catch that light in glints and glimmers, reflecting the One who gives it. Jason Bolt – Holton, Ind. Janna Lodwick – Novi, Mich.
Stacey Schaub – Rockford, Mich. It took more than one student to create this concept, which is the result of several ideas. One student had the idea of splitting the painting in sections, almost like stained glass. Another student had the idea of a collage. 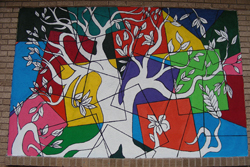 Ultimately, one tree was chosen and painted in a sectioned collage look. Mandy Fischer – Lindenhurst, Ill.
Robert Navarro – Crown Point, Ind. Proverbs 3 talks about how wisdom bestows well-being and in turn, it describes wisdom as a tree of life. I want people to be able to read through Proverbs 3 and not get lost in the symbolism of it but instead be able to look at our piece and realize the meaning behind it. The wisdom that we gain should ultimately be used to praise God, just as you see the tree of life, in our mural, praising the heavens. Wisdom is something to seek after and hold on to because it is our comfort and life but it should never cause us to lean on our own understanding but instead, it should draw us closer to the one who granted us wisdom. This is the essence of our painting. I believe that in everything we do, we do it in an effort to praise God. In my own wisdom of art and beauty, I’ve tried to praise God with it by creating this mural in hopes that others would be inspired, encouraged, or challenged. I believe that the overall goal of this piece would be to have people to be able to pick out the symbolism that we have carefully placed into the piece and that it may be a reminder to praise God with the wisdom that He grants us. Going into this project I wanted to create a unique mural that had a strong light source and a sense of depth. 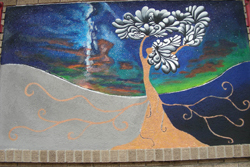 The themes we were given for the murals were the tree of life and the broad concept of life itself. For the border, I drew a lot of inspiration from two sources: illuminated manuscripts and the Celtic tree of life. I love the intricate borders and beautiful images in illuminated manuscripts like the Book of Kells. In the course of my research I came across a Celtic image for the tree of life where the branches grew out and around became the roots of the tree. 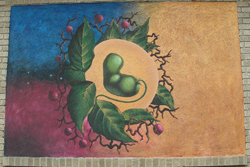 The image in the windows of the mural was based on the theme of life. 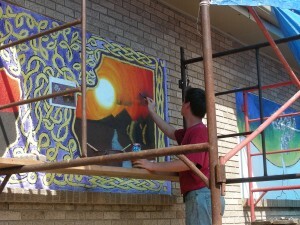 While I love the imagery that illuminated manuscripts have they lack depth, which was one of my goals for this mural. I also needed a strong light source for the image. So I thought about life and the things I like to do and the thought of a sunset hit me. I love sunsets and they have both the depth and light source I was looking for. 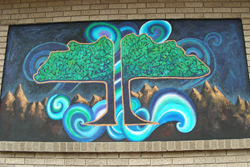 The tree of life as mentioned in Revelation was the inspiration for this mural. Revelation 22 speaks of the restoration of the Garden of Eden. In this new Eden, there is the Tree of Life that stands on both sides of a river; its leaves are for the healing of the nations. This mural is my imagining of that concept. The river is the water of life and it flows from the throne of God. Hopefully, this piece will help the audience imagine God’s future promise of a restored Eden. It took a whole team of people to get each of these murals to completion. Gabrielle Clouse, Cassandra Gareiss, Erick Anderson, Justin Teffeteller, Cynthia Bryan and Justin Hoffman all helped immensely in this process – from brainstorming to painting. Erick Anderson – Gurnee, Ill.
Gabrielle Clouse – Niles, Mich.
Cassie Gareiss – Columbia City, Ind. Justin Teffeteller – Hughesville, Pa.
Katherin Yeargin – Orlando, Fla.
Fruit is very symbolic in classic literature and thought – especially the idea of the fruit from the tree of the knowledge of good and evil in Genesis Chapter Three. I wanted to capture some of the power of that symbolism in this mural. The colors chosen are all symbolic (for instance, blue traditionally represents innocence in art and literature.) The apple is symbolic as well since it is the fruit traditionally associated with the Fall of Man. There are three crosses, rather than one, visible in the bite mark. I love the snapshot of the meta-narrative of God’s purpose for mankind given when these three men died. One robber, a sinner, mocks the Man next to him and never repents, but ends his life in misery and cynicism – to his last breath. The Man in the middle, in the throes of death, is the Christ in the act of redeeming mankind. Then there is the third man, a criminal, and a sinner, who begins just as antagonistic to Christ as the other, but who changes at some point during the ordeal and admits that his punishment is merited, that the Christ’s is not, and acknowledges Jesus as Lord of the Kingdom. Christ tells this man that he will be in paradise – without doing anything else but finish his life hanging on a cross. It is the perfect illustration of the human condition and the pain, grace, and glory that overcomes it. I wanted to reference this by representing all three crosses rather than one.